Plus 2 Clothing – Styles For T..
Gladys Knight Glistens in a Wh.. 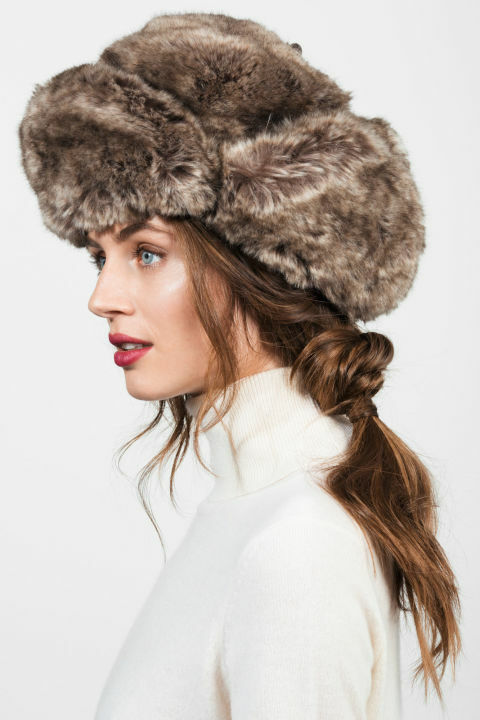 Embrace hat hair this winter with styles that are simple, surprising and far from an afterthought.A pretty knotted ponytail with soft, face-framing pieces does the trick of adding femininity to a heavy hunting hat. Separate your hair into three sections like you would for a classic braid, then tie the two on the outside together in a knot in front of the middle section. Wrap them around and knot them again in the back, and finish by securing the whole ponytail with an elastic. With the band? Road-tripping through the Southwest? Top off loose waves and a handful of peekaboo braids with a felt hat in rich ruby. Pigtails are a beanie no-brainer—the rougher and more deconstructed the better when there’s a pom-pom in the mix. Alternate between fishtail-braiding, tying knots and doing the classic three-strand weave down the length. Who says crimped hair can’t also be sleek, sophisticated hair? With a light hand, run a narrow texturing iron down the length of a smooth and low side ponytail for a feathery effect only noticed up close. Rag & Bone Floppy Brim Fedora, $395.00. Whether you’re racing down the mountain or sipping spiked cider in the lodge, go for a center-parted ponytail that transitions from slick and shiny to big, bushy and gorgeously windblown. Tease out crimped strands and mist the ends with hairspray. fantastic component of writing at around this place.